Ratanamankin and Ratanasanrwe are the pagodas built of King Ba Saw Phyu on the spur of Haymawon mountain in AD 1459. 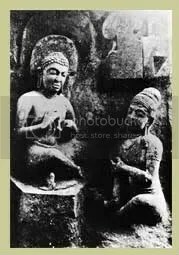 Only the stone Buddha images can be worshipped in the perfumed chamber as the pagoda fell into ruins. It is a distinction that the Buddha image and the throne were built separately without joining to the western wall in the perfumed chamber.